The Prince took pity on the beautiful enchanted Firebird and set her free. In gratitude, she gave the Prince one of her feathers, and promised to come to his aid in his hour of need..
Media: Head, hands and feet of tinted Super Sculpey. Black mohair pulled back into bun. 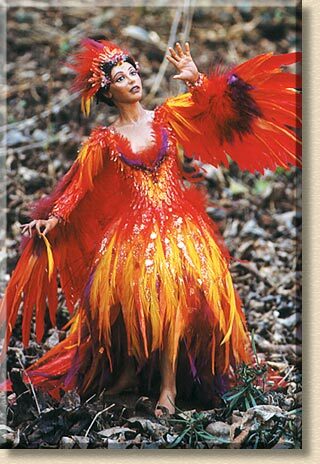 She wears a dress of bright red, orange & purple tulle and feathers. The skirt is layers of tulle with feathers glued into it. The top layer of the skirt is yellow feathers. Her sleeves and bodice are red fabric over which individual flower petals are glued one at a time. Wings are made of red and yellow feathers. She has a headdress of red and yellow feathers and flower petals. Props: She holds a single yellow feather in her right hand.